The Great Backyard Bird Count is an annual four-day event that engages bird watchers of all ages in counting birds to create a real-time snapshot of where the birds are across the continent. Anyone can participate, from beginning bird watchers to experts. It takes as little as 15 minutes on one day, or you can count for as long as you like each day of the event. 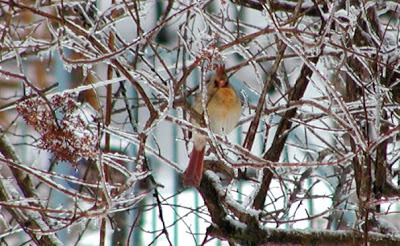 The 2010 Great Backyard Bird Count takes place from Friday, February 12 through Monday, February 15. The event is a project led by the Cornell Lab of Ornithology and the National Audubon Society, along with Bird Studies Canada. The information from the Great Backyard Bird Count will be used by scientists to study bird populations and how a bird species’ range expands or shrinks over time, the effects of the environment on migration patterns, and what kinds of birds inhabit different areas, like cities and suburbs. As members of the Cornell Lab of Ornithology, we’ll be participating by — you guessed it — counting birds at the Inn on Mill Creek this weekend. Just over the past couple of days, we’ve seen several different types of birds, including Cardinals (like the proud female cardinal pictured above at the Inn this past weekend), Tufted Titmice, Carolina Chickadees, Song Sparrows and more. This will be our second year to be a part of the Great Backyard Bird Count. We’ll try to post our results on our Bed & Breakfast Facebook page next week. Anyone in the United States and Canada can participate by counting birds over any period during the four-day event, then submitting a checklist to the Great Backyard Bird Count website. Last year, over 94,000 checklists were submitted, and North Carolina came in third in the number of checklists. Asheville, Black Mountain and Old Fort, the towns closest to us, were all represented. The Great Backyard Bird Count website is nice because it shows results sorted in a number of ways and also includes a map that is updated as results come in. We look forward to seeing how our area does this year!